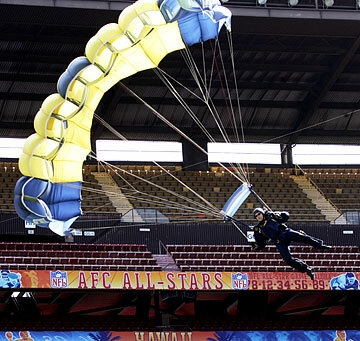 A member of the team of Navy Special Warfare specialists known as the Leap Frogs made a practice drop into Aloha Stadium yesterday during Pro Bowl Ohana Day. TEN minutes before today's 1 p.m. NFL Pro Bowl kickoff, members of the Navy's elite Leap Frogs parachute demonstration team will jump out of an Air Force C-130 cargo plane from about 10,000 feet and fall towards Aloha Stadium's 50-yard line. Anywhere between 5,000 to 2,000 feet from the ground, the Navy's Special Warfare specialists will pull their rip cords, unveiling their yellow and gold canopies embossed with the words "Navy SEALs." One jumper will lead the formation with red smoke trailing behind him while two others will be stacked vertically with the last Leap Frog, Chief Petty Officer Larry Summerfield, unfurling the American flag. The jumper above him will be carrying the NFL banner. "It's a very tricky jump," said Chief Petty Officer Dave Casper, leader of the 13-member team on Friday as eight Navy SEALs and combat boat crewmen made their first practice jump into the Halawa complex. "Aloha Stadium is so different," said Casper, who has been a Navy SEAL for 16 of the nearly 18 years he has been in the service. The Leap Frogs team made a practice jump on Friday. The Leap Frogs will also be part of the Pro Bowl activities today. "Because of its corners," he added, "there is less open space and the winds blow in different directions in the stadium." On Friday, eight Leap Frogs in dark blue jumpsuits made practice jumps out of the back end of a C-130 Hercules cargo plane from 4,000 feet because of the low cloud cover at 2 p.m. 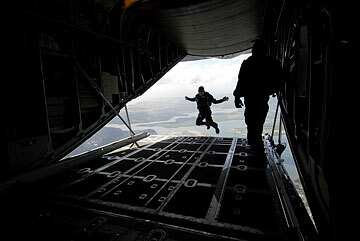 The Navy said that "a typical Leap Frogs performance consists of 14 jumpers leaping out of an aircraft at an altitude of 12,500 feet. During free fall, jumpers reach speeds of 120 mph and can accelerate up to 180 mph by pulling their arms to their sides and straightening their legs into what is called a "track." 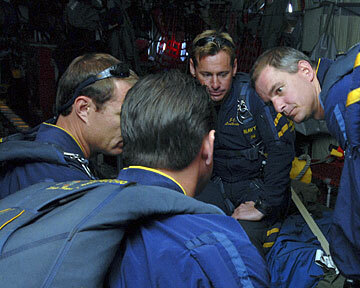 "The jumpers typically open their parachutes at around 5,000 feet by releasing a smaller pilot chute, which deploys their main blue-and-gold canopy," according to the Leap Frogs' Web site. On Friday, Casper said the eight jumpers didn't plan to practice any formations, but "just a straight jump into the stadium." Chief Petty Officer Dave Casper, right, conferred with members of his team of special warfare specialists known as the Navy's Leap Frogs on Friday before making the team's first jump in Hawaii this year. 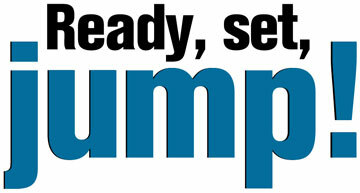 Casper said the Leap Frogs will typically do about 50 demonstrations a year. Only eight of the 13 Leap Frogs, who arrived in the islands Thursday, made Friday's jump, with the remaining five stationed on the football field in the Halawa stadium monitoring the operations. Casper said that those on the ground were the newest members of the Leap Frogs. Casper said the Leap Frogs will typically do about 50 demonstrations a year and today's jump will kick off their 2006 season. Next stops will be San Diego on Feb. 25 and a jump to commemorate the opening of the Dodgers baseball season in Los Angeles on April 3. Half of his 13-member parachute team have been in either Iraq or Afghanistan, said Casper, who also has served in Iraq. 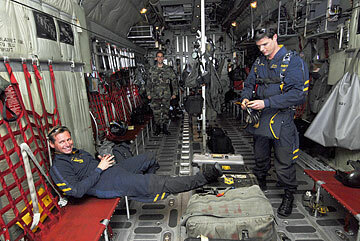 Petty Officers J.C. Ledbetter, a Navy combat boat crewman, and Josh Leasure, a Navy SEAL, prepared for a practice jump in Aloha Stadium on Friday in an Air Force Reserve C-130 Hercules cargo plane. 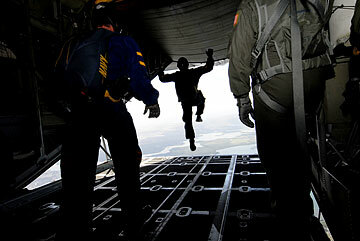 The parachute team began in 1969 when Navy SEALs and frogmen volunteered to perform at weekend air shows. 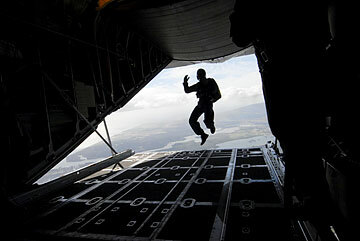 The team was commissioned by the Navy as the U.S. Navy Parachute Team "Leap Frogs" in 1974. Casper said Navy SEALs and Special Warfare commandos consider a three-year tour with the Leap Frogs as "a good assignment." "It's a break from operations," said Casper. That is because Special Warfare specialists are away from home at least six months of every year. While in the islands the Leap Frogs will have made three jumps -- Friday's practice maneuvers, an 11 a.m. plunge yesterday at the climax of the Pro Bowl's inaugural Ohana Day festivities and today's Pro Bowl. Yesterday, they landed within the 40 yard line with several jumpers carrying an NFL flag and others trailing colored smoke canisters.